Marina Buschinski, 28 years old, was born and raised in Lüdenscheid near Dortmund, NRW. In 2012 she finished her vocational training as a fitness/health trainer at Feminin Aktiv in Osnabrück and obtained a Bachelor of Fitness & Economics and Sports Sciences at Deutsche Hochschule für Prävention und Gesundheitsmanagement. After finishing classes as Master of Business Economics and Sports Management in Cologne she started her own business. 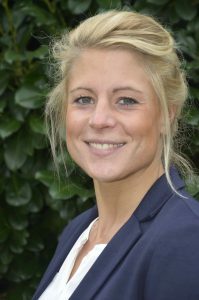 Since July 2016 she works as a product coordinator and project manager at SBH West GmbH. In her leisure time she likes to spend time with her family and friends as well as travelling and attending sports events of all types. She plays soccer in the third-tier soccer league at SC Fortuna Köln and coaches a girls’ soccer team.